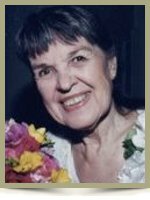 Thompson – Valeria Celia (Baczanski) (Roireau) Roireau, 89, artist, educator, landscaper, seamstress and model, passed away on Saturday, February 1, 2014, in Westview Rehabilitation and Care Center in Dayville. Valeria was born August 19, 1924, the youngest child of the late John and Stasia (Ignatowicz) Baczanski of Webster, Massachusetts While a teen, Arthur “Ray” Roireau caught her eye while out with girlfriends. After a wartime romance and marriage, Val followed Ray to his training in NYC where she became a model for Lerner. After her new husband shipped out to join WWII, Val returned to Webster, MA to await his return. After the war they started a family. Besides being a model and a mom, Val had a varied career. She worked in the office of a record factory. As a Teacher’s aide at Thompson Public Schools and Tourtellotte High School, Val took great interest in witnessing children learning and tried everything, even comic books to instill a love of reading. Ever the fashionista, Val enjoyed sewing clothes for herself and daughter Elaine from examples she found in magazines and dressing in the latest styles. She continued her sewing expertise into a career as a mender at a woolen mill. An avid churchgoer, she remained faithful to her original church, Saint Joseph’s of Webster, even after moving to Connecticut. Val was supportive of the church and took an active part in the St. Joseph Women’s Club. Val had the ability to get anyone talking and would strike up a conversation be it in be in the middle of a busy city street or an empty parking lot, Val would be found making a new friend, often to her children’s great embarrassment whenever they went out. Val was a passionate lover of a good cup of coffee, which she drank black; a point of pride. She was an accomplished artist, studying with noted artist Foster Caddell of Northlight Studio, and filled her home with the oils and pastels that she created. She and her husband Ray built their own house and she landscaped the yard herself, building stone walls that still stand to this day. Planting and enjoying what grew around her, she would have a cup of coffee and survey her efforts. But as in all things, time passes and her first husband, Ray, died leaving Val alone in the house they built and yard she created. Surprising herself at age 75, Val married long-time friend and Ray’s cousin, Albert, another Roireau. Always practical, she didn’t even have to change her name. Val was artistic and had a vivid imagination which became quite elaborate in her later years, but, unfortunately, Val contracted Alzheimer’s. Ever cheerful, she never noticed a problem. After her husband Albert died, Val was thoughtfully cared for by the staff at Westview Nursing Home and her long-time physician Dr. Joseph Botta. She is survived by her three children: Elaine Mosley and her husband Lanny of Jacksonville, FL; Arthur Roireau and his wife Gwen of Putnam, CT; and Alan Roireau and his wife Beth of Aroda, VA. They all now have children of their own who loved their grandmother. Val took pride in her grandchildren Amanda, Arthur Edward, and Cooper and would brag to anyone who would listen. Granddaughter Amanda made Val a great-grandmother four times over with Ethan, Kristoph, Grayson and Natalie all of Jacksonville, FL. She was predeceased by her siblings Anthony, John and Frances. Relatives and friends are invited to visit with Valeria’s family from 5:00 to 7:00 pm on Sunday February 9, 2014, in the Gilman Funeral Home, 104 Church St., Putnam, CT. A Mass of Christian Burial will be held on Monday February 10, 2014 at 10:00 am meeting directly at St. Joseph Basilica, 53 Whitcomb St., Webster, MA. Burial will follow in St. Joseph Garden of Peace Cemetery. Val loved flowers, so feel free to send any arrangements to the funeral home. For memorial guestbook visit www. GilmanAndValade.com. I’m very sorry for your loss Al, I’ll be thinking of you and your family. Thoughts and prayers for you and the family at your time of loss. The description is that of a life well lived and enjoyed to the fullest. Deepest sympathies to the Roireau family. So very sorry for your loss. There is no more special person in one’s life than their mother and grandmother and the loss is very deep. Please accept our deepest sympathies during this sad time. So sorry to hear of your loss, Alan. I can still remember your mother helping at the school many, MANY years ago when we were small. I remember her smile. Thoughts and prayers are with you. I am very very sad to hear about your mom’s passing. Over the years, I have heard so much about her from you that I felt I knew her myself. She sounded like a wonderful woman and, i’m sure, an amazing mom. God bless you my friend. She sounds like a terrific lady. Very sorry for your loss. Elaine, Lanny, and family, so sorry for your loss. I hope you can take comfort in knowing that she is in a far better place now. An outstanding obituary…nicely done. I knew some of this about Val but learned a great deal more. She was quite a gal! I know her family will enjoy the memories. Thanks for sharing some here. Wow, Al, what I full and active life your mom lived! My thoughts and prayers are with you and your family. Peace. Al, Beth, and family, very sorry for your loss – it is so difficult loosing your mom. Let us know if there is anything we can do for you.. Saddened by her passing, but warm memories of her kindness and spirit remain. We send you all our deepest sympathy at this time of your loss, we will keep you in our prayers. my thoughts and prayers are with your whole family. It is always difficult to lose your mom. Though we have lost track over the years, I remember Val with fondness. We had many good times together while raising our children and attending art classes together. May she rest in quiet piece..
Sending our condolences to the family of Val. She was a dear friend and neighbor for many years. We have many fond memories of the family. May Val rest in quiet piece. So sorry to hear about your mom’s passing. She sounds like a very interesting woman. My thoughts and prayers are with you and your family at this sad time. I wish I could be there with you on this occasion. This is always very difficult, even if you are a little prepared. Although I met your mom only a few times, I’ve raraely encountered anyone as cheerful and positive. She was always certainly a grand hostess, and I will cherish the memories of times spent in the house in Thompson. You can certainly tell it was tended with loving care.